Every job is different, and you need the right dumpster size for your plans. 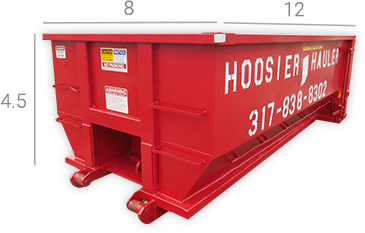 Hoosier Hauler provides a selection of sizes in the greater Indianapolis area so you can get the one that applies to your debris: dirt or brick, wood or metal, yard trash or demolition debris, get the right dumpster for the job. If you don’t know what dumpster size is the best fit, don’t hesitate to ask! Experience at Hoosier Hauler has given us insight, and we can help you decide which compact, roll-off dumpster is right for your project.  Strong and compact, this size is equal to 3 full-sized pickup loads and perfect for your smaller jobs. Larger than its 6 cubic yard cousin, this dumpster size is equal to 5 full-sized pickup loads and is great for your standard tasks. This dumpster is equal to 7.5 full-sized pickup loads and will come in handy for your larger projects. Holds up to 10 full-size pickup truck loads. The largest of the five available dumpster sizes holds up to 15 full-size pickup truck loads. All dumpster sizes are compact, able even to fit into an alley or home driveway. Our dumpsters are designed to minimize the weight on your property to give you all of the benefit without risk of damage. Each dumpster also has one door in the rear for easy walk-in loading. You can rent any dumpster size for 3, 7, 14, or customers can call for pick-up, and ask about extensions and weekend pickups. Whatever your project, Hoosier Hauler will safely transport trash away from your site with the fastest, most reliable junk removal service in the greater Indianapolis area.